Shortly after Queen Isabella’s death (1504), Philip the Handsome grabbed the crown of Castile for himself. His wife Juana, daughter of Ferdinand and Isabella, to whom it rightfully belonged, was beginning to lose her mind, so she was incapacitated for government. Philip I of Castile, the first Austrian Hapsburg in Spanish history, was a dashing young prince who had a tremendous attraction for women that drove his wife insanely jealous. 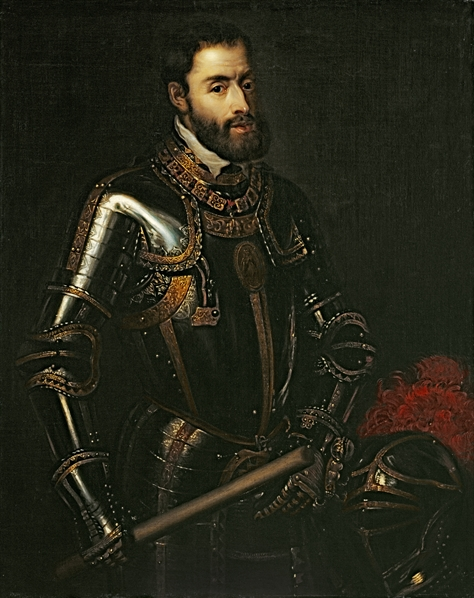 From their union was born Charles I of Spain (Charles V of the Holy Roman Empire) in Flanders in the year 1500. Philip the Handsome’s brief reign was a riotous and reckless one and as Juana was judged insane, the young Prince Charles was left without either father or mother at a very tender age. He was educated in Flanders, and at Ferdinand’s death in 1516, when he was called to occupy the Spanish throne, he did not speak Spanish. He was greeted in Spain by anything but enthusiastic acclaim. Nobody liked him. Charles, like his father before him, placed Flemings in high positions and quickly alienated the Spaniards. The new king was accustomed to considerable pomp and luxury in Flanders, and clearly showed his dislike of the austere Spanish court and even of his Spanish subjects. In 1520, the townsmen prepared for a rebellion. This revolt of the comuneros had strong support in the municipalities but it was ineffectively organized, and the commoners were crushed by the superior forces of the crown. The nobles had backed the king in this fight, insuring the triumph of an absolutist regime. The suppression of the commoners was the manifestation of something that was to recur many times in the future history of Spain: the defeat of the best and noblest hopes of the Spanish people in every move they have made for a decent government. It happened again with the failure of the liberal Cortes of Cadiz in 1812; it was repeated with the failure of the First Republic in the 1870’s; and the final disastrous repetition was the failure of the Second Republic in the 1930’s followed by the bloody and catastrophic civil war. Moderation in government has never stood much of a chance in Spain. Charles’s reign placed Spain in the mainstream of European politics. From his mother and his grandfather, he had inherited Castile, Aragon, Navarre, Sardinia, Sicily, the kingdom of Naples, the Roussillon, the Spanish colonies in Africa and the New World; from his father, he had inherited large territories in northern and eastern France, the Low Countries, and Luxembourg. He was also heir of his grandfather, Maximilian I, ruler of the Hapsburg dominions in Austria and Bohemia, and emperor of the German or Holy Roman Empire. At Maximilian’s death in 1519, Charles succeeded him in both positions, and thus became monarch of one of the largest empires in history, certainly the greatest in Europe since Charlemagne. It was, however, a loosely joined empire, vulnerable at every extremity, and Charles’s attempt to synchronize its various interests and its various regions was doomed to a almost certain failure. The king nonetheless made a noble try, gradually strengthening his hand and centralizing his power. He became engaged in wars all over Europe and America. In Europe the aim that guided his life was to overcome the Protestants and establish an immense Catholic empire. In America his main idea was to grasp as much land and as much wealth as possible, and for both these purposes there were the Spanish conquistadors. By far the most important event in the reign of Charles V (1516-1556) was the opening up of the New World. Under Charles the conquistadors made world history: Cortés in Mexico, Pizarro in Peru, Valdivia in Chile, Mendoza in Argentina, Quesada in Colombia, De Soto in the US, Alvarado in Guatemala, and many others. Within a few brief years Spain conquered and was governing a territory two or three dozen times the size of the mother country. Great wealth began to flow to Spain from Mexico and Peru, the mines of gold and silver continued to pour forth a torrent of riches for years to come. Many of those who went to the colonies became wealthy overnight. Even the common soldier prospered. Within a couple of decades Spain was well on her way to becoming an industrial power. But there too all the wrong decisions were made, and the king was responsible for most of them. He continued to spend huge sums in fruitless European wars and was always at his wits’ end as to how to pay them. The wealth of the New World was thrown away in futile military campaigns. The Spanish colonial monopoly was equally disastrous. The logic behind it made sense but did not work in practice. In 1503 Spain established in Seville the House of Trade, or Casa de Contratación, which was to direct all colonial commerce. Only Spaniards could trade with the colonies, goods must be carried in Spanish ships, and for protection these ships must travel together in convoys. The output of the mines would thus reach Spain undiminished, and Spain, in turn, would sell to the colonies the things they needed to buy. It sounded like an airtight system, profitable to both parties. England, Holland, and France later established similar monopolies, and they worked relatively well. The big differences was that these countries had strong, productive industries which could supply the wants of their colonies at reasonable prices, whereas Spain had a rapidly weakening industrial system, a declining navy, and a disintegrating merchant marine. To make matter worse the convoys sailed irregularly, and were often attacked and robbed by buccaneers or foreign enemies. The American colonies, unable to obtain what they needed from the mother country, bought them in any way they could. A thriving contraband trade sprang up. In some years this illegitimate commerce supplied at least 75 per cent of the colonial imports. The result was that while an abundance of gold and silver was produced in the Spanish colonies, which indeed tripled the total European supply of those precious metals within a century, there was no real wealth in Spain herself, no lasting economic prosperity, no permanent progress. And in the colonies had grown a widespread disrespect for the laws of the mother country. By the end of Charles’s reign Spain had slumped back into her proverbial poverty. 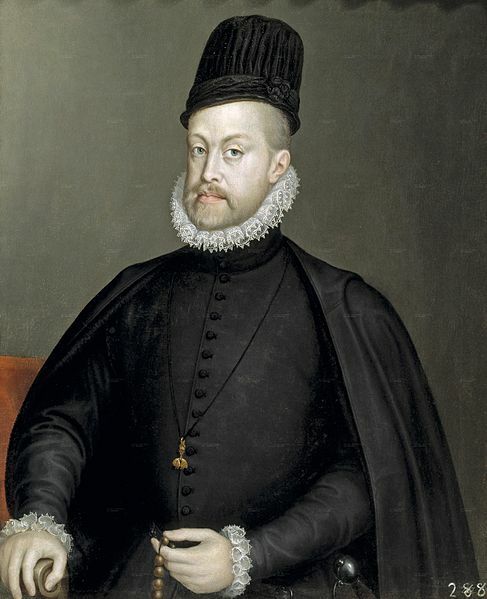 Philip II came to the throne in 1556, when he was twenty-nine. His father, world-weary and exhausted from his many campaigns, abdicated and retired to a monastery in Extremadura. Here he passed the final years of his life in meditation and prayer. Philip’s reign began with a spectacular auto-de-fe at Valladolid at which several heretics were burned at the stake. The king regarded heresy as a damnable thing, one to be punished with cruel efficiency. Philip now stood on the stage alone, the most powerful monarch in Christendom. He held slavishly to the distrustful absolutism of his father, and believed deeply in the divine inspiration as ruler. His methods of statecraft were rigid and inadaptable. He was no neophyte at the game of espionage and duplicity. He was anxious to hold all of the strings in his own hand, and thus wore himself out with the dreary routine of government. The success of the protestant revolt outside of Spain meant the triumph of the intolerant “Counter Reformation” inside of Spain. Spanish students were prohibited from studying in foreign universities, where it was feared they might become contaminated with heretical Protestant notions. The church began to proscribe certain books and published its first Index expurgatorious in 1546. Spanish thought was circumscribed within a narrow orthodoxy which prevented the free influx of foreign ideas. In thought as in economy and government Spain began to lag behind in the procession of European nations. This dogmatic, single-minded intensity of belief lost Spain the Flemish provinces by driving those people toward Protestantism, which began to take on dimensions of a symbolic crusade against the intolerable cruelty and injustice of the Spanish oppression. In his own country Philip’s persecution of suspected heretics was merciless and unconditional. Gone were the days when Erasmus, once the friend of Charles V, could be admired in Spain. Gone was the right to use freely man’s God-given and inquiring mind. Spain was sunken now in an ossified dogmatism from which the nation has not yet recovered. Nearly everyone who has written about the Spanish Inquisition is careful to point out that this institution was not limited to Spain, and that religious fanaticism and cruelty were not exclusively Roman Catholic qualities. It happened in nearly every country in Europe. Spain was not a unique case when it came to religious intolerance during the Golden Age. However, Spain is a unique case when it comes to how long this intolerance lasted. The Inquisition itself was not abolished until 1820, and as far as 1963, there was no religious freedom for non-Catholics in Spain. In the year 1561 Philip decided to move the capital of Spain to Madrid, which was then only a straggling and unimportant country town. Madrid was in the very centre of the country, and would make a fine hub for the absolute rule of the nation that he envisaged. Besides, it would be a capital that the king himself would mold, and Philip always regarded himself as the great architect of Spanish destiny. The fact that Madrid was a drab town without important history or tradition made it doubly acceptable. He would give it a history. He would give it a heart, his own. No, it would be more accurate to say that he would give it a paper heart, for Philip II was el rey papelero each one of which he must examine, digest, ponder, pass on, alter, cancel out, extend, amend, or simply sign. He must see them all. He was indeed the paper king, and Madrid was capital of his endless files. Hence Madrid became a kind of political dead weight athwart the stomach of Spain. It was neither ancient, nor beautiful, nor prosperous, nor forward-looking. Rather it was like Philip himself: severe, riddled with bureaucracy, unlovely, a place only where the laws were made and the politicos lived. 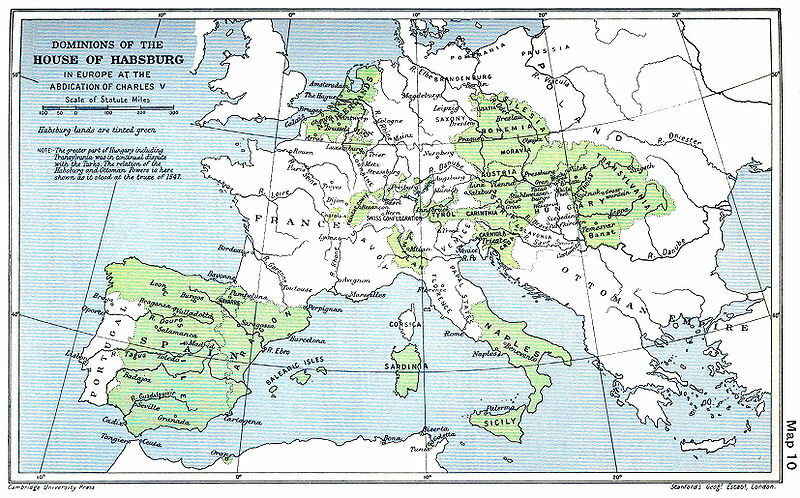 Madrid, Seville, and Toledo were the three main cities of the country during the golden age. When the king moved the capital from Toledo to Madrid, at least ten thousand government officials and members of their family came along with him. Toledo suddenly went into decline, and Madrid spurted up in the scale. It thus took on the flat and unimpressive appearance that still characterizes the city today. A couple of years after moving his capital to Madrid Philip began the construction of the Escorial, the greatest architectural monument of his reign, thirty-two miles northwest of the new capital. This severe Renaissance style building is the stony epitome of Philip II. It is as grim and unyielding as the Spanish Inquisition, as stern and somber as the paper king himself, as gray and gloomy as the royal heart in the latter half of the sixteenth century. Philip’s father, the Emperor Charles, also left his monument in the unfinished circular Renaissance palace built within the precincts of the Alhambra, in Granada. Both buildings contrast harshly with their surrounding. In 1560’s, as work on the Escorial progressed, Philip was head over heels in debt. The foreign wars continued, Flanders was a continuous thorn in his side, the English buccaneers were making his life miserable on the sea, and Spanish industry, unable to compete with that of other European countries, was stagnating. The incomes from America vanished quickly and he had to borrow more, with astronomical interest rates. In 1575 he simply repudiated all of his foreign debts. Taxes became intolerable, and the economy began to break down completely. People were thrown out of jobs, and the streets became infested with beggars, pícaros, parasites, run-down petty noblemen, soldiers who had returned from wars without money and without hopes, useless derelicts and vagabond of all descriptions. Aversion to honest labor became a national calamity. The Spanish picaresque novel, in which the protagonist is an anti-hero, a rogue, a sharper, gives a full account of what was happening in Spain. The exhausted country was gliding over reality, not coming to grips with the facts of history, asking for a handout or for some magic to suddenly change all that into a different life. They never found it. After twenty-two years of labor, with three hundred men working round the clock, the Escorial was finally finished in 1584. King Philip II himself often sat in a chair cut out of mountain rock above the valley and observed the construction. In his declining years he retired to the grim monastery to live and to die, in 1598. As the nation’s golden opportunity was wasted and its lifeblood spilled on battlefields far and wide, the face of Spain underwent a gradual change. The process of urbanization became more rapid, and there was feverish activity in the building trades, particularly for the government and for the church. A few wealthy families erected splendid mansions and filled them with art objects from all over the world. But these things were only for the very few who had risen to the top. The population of the country as a whole was now more clearly than ever divided into two classes: the few who were rich, and the many who were poor. Between the two yawned a great abyss. The general aspect for living in the cities and towns of Spain showed little improvement over medieval days. At the other end of the spectrum, courtly ceremonies became more and more lavish as the nation grew poorer and poorer. A feverish and splendid activity kept mind and eyes off the canker beneath. The bullfight was, during the Golden Age, as it had been for centuries past, the great fiesta for the masses. Its history goes back to ancient times. Some trace the spectacle back to the Roman circus with its combat between animals and men. Some claims that the killing of the bull is a ritual that may be traces back to the Minoan culture on the island of Crete, many hundred years before Christ. Up to the late seventeenth century the bullfight was a spectacle in which the men who fought were always of the nobility. This was the way they proved their manhood to their ladies, to their peers, and to their underlings. In the late Golden Age professional toreros began to replace the hidalgos. These paid fighters usually came from the lower classes, and the whole feeling of the fiesta changed. So did the manner of fighting. The gentlemen had always fought the bull with lances on horseback; and horsemanship was a principal part of the spectacle. 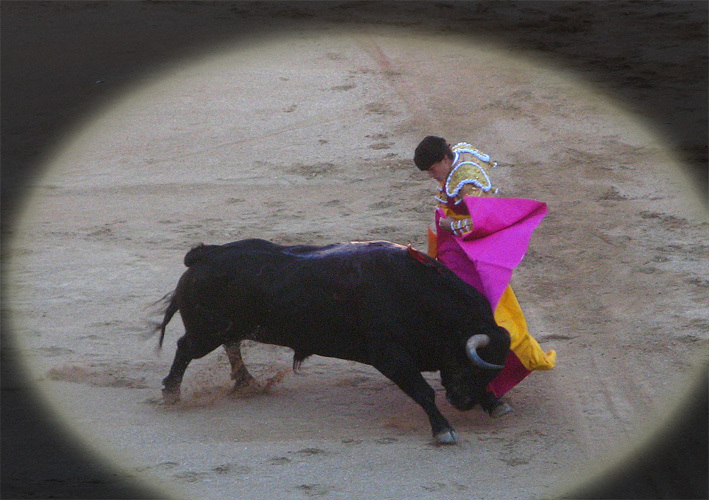 It is worth noting that the Spanish term for bullfight is corrida de toros. The word fight is not used, nor is the spectacle ever regarded as a sport in our sense of the word. It is a deadly ritual in which man slays the animal; the bull invariably dies. The whole thing is a kind of sacrifice; not a sacrifice to God but a sacrifice of a noble and courageous animal in order to prove man’s dominance over the greatest strength and bravery that the kingdom of the beasts can offer. The bullfight did not, of course, attract the attention of the entire Spanish public. Religious festivities, processions, and ceremonies came near to achieving such unanimous appeal. It was in these celebrations that the pomp and the solemnity of the Catholic Church showed to best advantage. 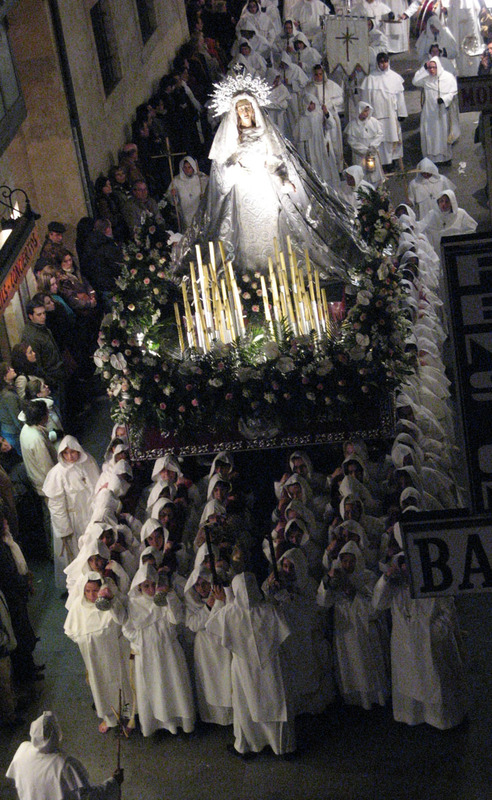 The cause for such celebrations were almost infinite: a fiesta in honor of the local virgin or saint, a canonization, the appointment of a bishop or cardinal, the foundation or consecration of a church or monastery, the arrival of one of the universally celebrated Christian holiday, and of course, the formidable auto de fe, or act of faith at which those condemned by the Inquisition were publicly punished, many of them strangled or burned in the inquisitorial flames.